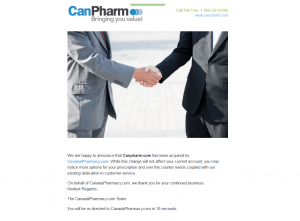 Upon entering the web address Canpharm.com into your browser, a page will appear that states “canpharm.com has been acquired by CanadaPharmacy.com”, and then you are automatically redirected to the new website and business. CanadaPharmacy.com is a true online pharmacy and medication retailer. Unlike many businesses who claim to sell prescription medications at a discount, this pharmacy actually does just that. Even more impressive is the fact that they require an actual doctor’s prescription for the sale of prescription medications. Right away this makes our review team very pleased with their business, as that is the only legal method for selling prescription medications. CanadaPharmacy.com sells both prescription and over the counter medications, at a savings of up to 80% off of the United States cost for those same drugs. This makes their prices far less expensive than many of the other online and physical retail pharmacies. Shipping costs are offered at three levels. Customers may choose to pay a $10 flat shipping rate for each order, a $20 shipping cost (one time) which covers shipping for one year, or a $50 one-time charge that will cover shipping for life. On multiple site pages, CanadaPharmacy.com provides customer service and contact information for their customers. They are easily reached by toll free number, email, or at their physical mailing address in British Columbia, Canada. Unfortunately, the positives of price, shipping, and legality are met with some very negative customer reviews through independent sources. According to the many reviews we located on complaintsboard.com, sitejabber.com, and resellerratings.com, a vast majority of the customer reviews were negative. Complaints were lodged stating that the medications that were sold were useless and not what was ordered, or just plain ineffective. Others stated that the company regularly practices a “bait and switch” on their customers in regards to the fraudulent medications. 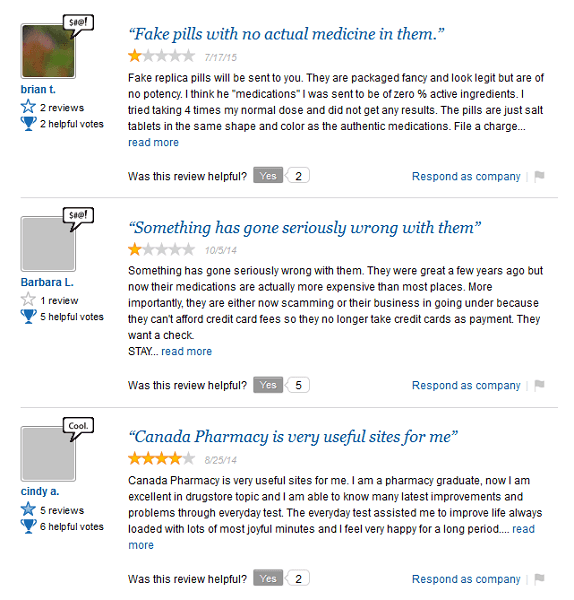 Still, other customers accuse CanadaPharmacy.com of acting in a harassing manner, and of being unethical. While there are a number of negative reviews on all three of these sites, there are also some very positives reviews mixed in. It appears that the customers either find this company to be horrible or fabulous, nowhere in between. It is difficult for us to determine what is exaggerated and what is in fact, in regard to many of these independent reviews, both the positives and negatives. There is only one promotion offered by CanadaPharmacy.com that we feel comfortable calling a coupon, and that is their referral program. Through this promotion, customers who refer a friend to CanadaPharmacy.com, and when that friend places an order of $100 or more, both the customer and the referred friend will receive a $50 credit towards future purchases. Overall, we are giving CanadaPharmacy.com a rating of 2 out of 5 stars. 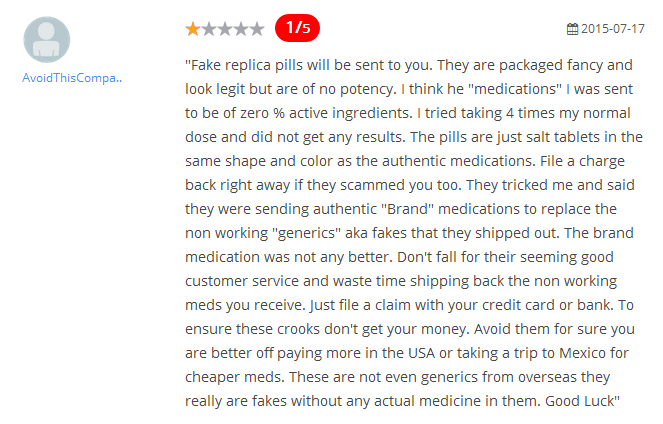 We considered a lower score, based on the many negative reviews, but have come to the conclusion that successfully shopping from this online pharmacy is going to become the customer’s own responsibility. We recommend that customers ask plenty of questions about the medications that they are ordering, and do their own due diligence before actual money exchange. 49 years ago | No Comments on RiteMED Sildenafil 100mg Buying Guide: Why Sildigra Works Better For Men with ED!